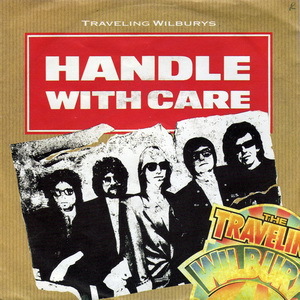 In 1988 Bob Dylan changed his name to Lucky Wilbury and released an album with his four brothers, Nelson, Otis, Lefty and Charlie T. Their first single, which hit number two on the pop charts, was “Handle With Care”. This was a revitalization of Dylan’s career. I was completely certain that it was a sign of the apocalypse. How bad was “Handle With Care” to the eighteen year old me? It was so bad that my father bought the album on CD (one of the first CDs ever to come into our home – I didn’t buy my first until three or four years later, I was convinced that the whole thing was a complete scam by the record companies). For me, the Traveling Wilburies were, literally, your father’s Dylan, and I wanted absolutely nothing to do with it. I remember that I sort of actively sought to shun the song and to avoid listening to it. The problem was that the song was popular, the album was popular, and, dispassionately, it is a far superior single to “Silvio” (which, of course, I also didn’t like). The Dylan renaissance was beginning all around me and I wanted nothing to do with it. I had become a cranky young man railing about Dylan selling out! Dylan, who had disappointed his fans in, at least, 1966, 1969, 1972, 1979, and 1982, had finally disappointed me. Ironically, what drove me from him was the decision to release a well-produced album. I was a bit dim when I was eighteen, but so are most people at that age, so it wasn’t my fault. Listening to the song, it’s actually pretty good. Roy Orbison is certainly the highlight, but the whole supergroup thing works well because it doesn’t seem like a cluster of egos and clashing notions. The whole Wilbury’s project only sometimes works, but this is an example of it gelling. There is an extended version (by about two minutes) that was included with the CD single (alongside the b-side, “Margarita”). It is quite the step down in terms of production. It adds about a minute of the guitar part at the beginning and then seems to sample the chorus with bizarre over-production that makes it sound like the song is being recorded in an echo chamber. This version also really foregrounds the drums more than the single does, presumably to make it more club friendly. It’s quite the disaster – phasing synth noises have been added to the bridges, for example. It’s not better in any way, it’s just more, and this is not a song that needed “more”.